Protein is one of the essential nutrients that our bodies needs. This substance, with a basic structure of a chain of amino acids, is known as the building block of life. It is believed that all cells in our body contain protein, or are made from protein — from muscle, hair, skin, bone and connective tissue to hormone, enzyme, DNA, and neurotransmitter production. Protein facilitates the repairing of cells and the creating of new ones. It’s also essential in the development and growth of teenagers and children, and an important nutrient for pregnant women. Therefore, consuming high protein foods is crucial. A great source of protein is the foods we consume every day. High protein foods are broken down to amino acids during digestion. These amino acids are classified into three categories — essential, non-essential and conditional. Essential amino acids are not made by the body; they must be supplied through food. Nonessential amino acids are made by the body from the normal breakdown of protein. And conditional amino acids are those that are needed during stress and sickness. As part of your diet, choosing high protein low carb foods is essential in ensuring a balanced diet. How Much Protein Do We Need in Our Diet? Most people consume sufficient amounts of protein in their diet. Though the amount needed depends on one’s health and age, the Recommended Dietary Allowance is 46 grams a day for women and 56 grams for men. For an adult, this equates to two to three servings of high protein foods to meet these requirements. These amounts are easily exceeded by the majority of Americans. However, for weight loss or when trying to build lean muscle, you need to eat a lot more protein — about 120 grams a day. Consulting with a healthcare professional so as to determine your body’s individual needs as well as how high protein foods would fit into your daily energy requirements will yield the best results. A well-balanced diet needs to provide an adequate amount of protein so that a healthy person wouldn’t need protein supplements. In fact, vegetarians are capable of getting sufficient quantities of important amino acids by eating protein from different plant sources. 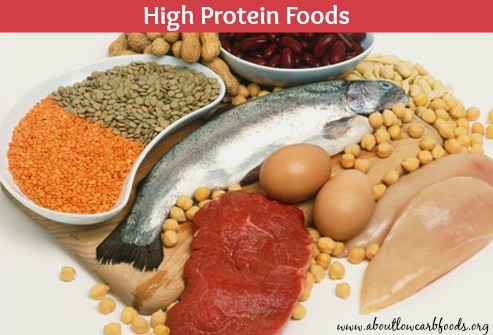 Some examples of high protein foods include meat, fish, cheese, milk, eggs, yogurt, tofu, soy, beans, legumes, lentils, grains, nuts, and seeds. 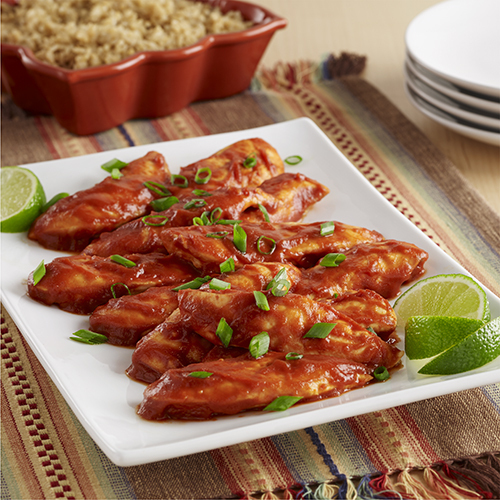 High protein low carb foods are also a great option to include in your diet. High protein foods make you feel full faster, resulting in the consumption of fewer calories in users, which subsequently leads to weight loss. High protein low carb foods decrease fat stores and weight, and can be beneficial in kick starting weight loss in individuals suffering from morbid obesity. By eating more protein and fewer carbs, the brain receives less hormones that stimulate hunger, leading to decreased appetite. When starting a high protein diet, it’s imperative to consume healthy protein foods. Some popular low carb high protein diets, especially the Atkins diet, encourage diets that are low in carbohydrates, high in protein, but also high in saturated fat. Research has shown that limiting the quantity of saturated fat in our diet reduces the risk of developing type 2 diabetes and heart disease, lowers blood pressure, and results in weight loss. For these reasons, it is vital to choose protein from healthy sources that are low in saturated fat. Remember to not only choose healthy protein sources, but to cook using healthy techniques as well. Adopting healthy cooking techniques such as grilling, poaching, roasting with a little olive oil, or dry frying avoids the addition of excess fat and calories to food.